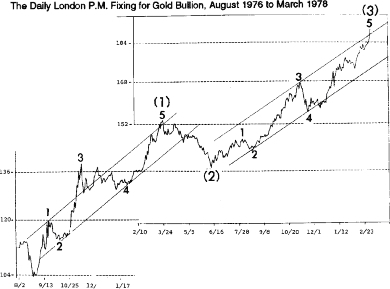 How do you choose one lesson from a basic tutorial that is chock-full of excellent information about Elliott wave analysis? You could browse through all 50 sections distributed over 10 lessons. Or you could do what some people do when they open a dictionary: let the book fall open and point your finger at a word. Sometimes you learn more from a random search than a deliberate one. That’s exactly how I chose this excerpt from EWI’s Basic Tutorial to show how clear the writing and illustrations are. The one best place to start learning about wave analysis is this online tutorial, which is available to all Club EWI members — a membership that is free and that brings you many resources about the kind of technical analysis and forecasting that we do here at Elliott Wave International. The topic that my electronic finger pointed to online when I opened the online Basic Tutorial was Lesson 6.2: Channeling Technique. These four graphs and the accompanying explanation give a tantalizing taste of what you can learn when you take The EWI Basic Tutorial. R.N. Elliott noted that parallel trend channels typically mark the upper and lower boundaries of impulse waves, often with dramatic precision. The analyst should draw them in advance to assist in determining wave targets and provide clues to the future development of trends. 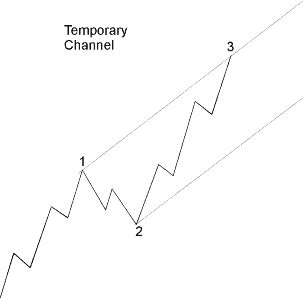 Within parallel channels and the converging lines of diagonal triangles, if a fifth wave approaches its upper trendline on declining volume, it is an indication that the end of the wave will meet or fall short of it. If volume is heavy as the fifth wave approaches its upper trendline, it indicates a possible penetration of the upper line, which Elliott called "throw-over." 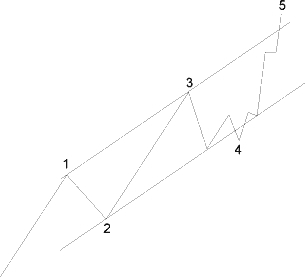 Near the point of throw-over, a fourth wave of small degree may trend sideways immediately below the parallel, allowing the fifth then to break it in a final gust of volume. 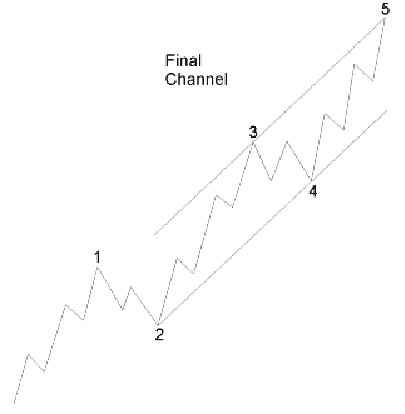 Throw-overs are occasionally telegraphed by a preceding "throw-under," either by wave 4 or by wave two of 5, as suggested by the drawing shown as Figure 2-10, from Elliott’s book, The Wave Principle. They are confirmed by an immediate reversal back below the line. Throw-overs also occur, with the same characteristics, in declining markets. Elliott correctly warned that throw-overs at large degrees cause difficulty in identifying the waves of smaller degree during the throw-over, as smaller degree channels are sometimes penetrated on the upside by the final fifth wave. Examples of throw-overs shown earlier in this course can be found in Figures 1-17 and 1-19. Keep reading this free tutorial today. Susan C. Walker writes for Elliott Wave International, a market forecasting and technical analysis company.